VOC is short for volatile organic compound. In plain terms, these are chemical liquids that evaporate at room temperature. Examples of these include solvents used in building materials and finishes (such as formaldehyde, acetone, benzene, ethylene and propylene glycols, paint thinner/turpentine). According to the US Environmental Protection Agency, VOC concentrations are consistently higher indoors (up to ten times higher). Paint is a significant contributor to indoor air quality because walls and ceilings are roughly 70% of a homes interior surface. When one of our customers bought a property in Birchrunville, PA we were asked to come in and propose renovations to the house and property. 5 years later on of our original ideas finally becomes a reality. The property had a hilltop view that allowed for a view of the landscape for miles. The original concept had the existing series of small decks becoming one large one but for now they are connected with a path. The patio and walk way are made of dry-laid 1" full-color flagstone in 12" square, 12" x 24", 24" square, and 24" x 36" flats arranged in a pattern. The steps are 7" x 18" x 48" treads layered in 11" runs. Post war home design made for small, formal, closed in rooms. With our social lifestyle “Open Floor Plan” design is the style of choice. This type of change requires the removal of walls that are both bearing and nonbearing. 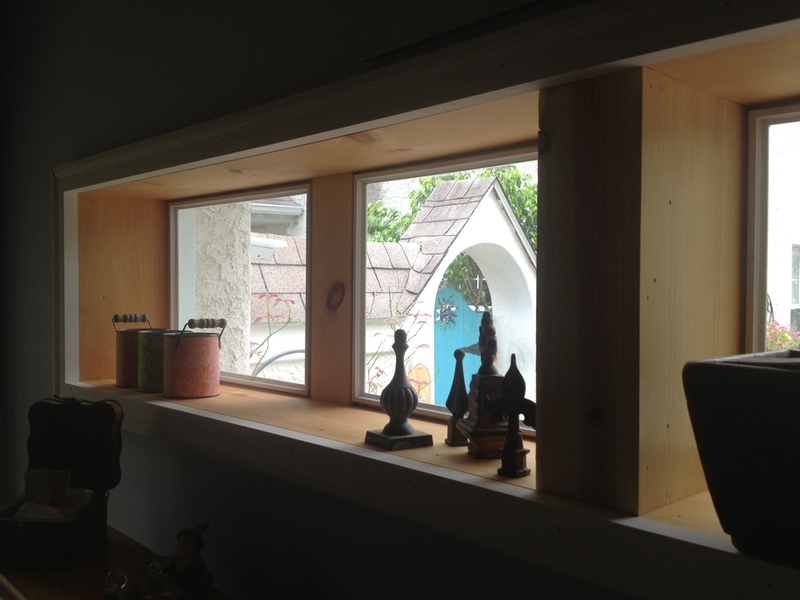 In addition we are doubling the size of the window as well as shifting the doorway from the mud room into the kitchen. We are also reconfiguring the laundry to be a dual purpose room laundry/pantry. In order to accomplish the last two tasks we need to cut through cinderblock walls. Since this home was built in 1958 we needed to test all the being removed, the adjacent walls and ceiling, and trim for lead content. Luckily we found none, but proceeded with the project as if the test came up positive. So up went the Zipwall to contain the dust, the plaster was then removed from the framing lumber, the concrete was cut for the new doorway and window, then the whole area was HEPA vacuumed and washed. Once the wall covering was removed we built a series of temporary walls, both on the main floor and basement levels to reinforce the ceiling joists while the bearing walls were removed. In order to provide the support strength to span the new opening that will not settle and crack the new walls we used LVL (Laminated Veneer Lumber) beams and posts. LVL lumber is an environmentally preferable product made of renewable biobased materials no added Urea Formaldehyde offering for sustainable, shrink/warp/split resistant lumber, that has low VOC properties. We installed a new pocket door in the laundry/pantry so that there would be no swinging door to get in the way. Two Andersen® 400 Series tilt-wash double-hung window were installed in place of the old inefficient double-hung window. As part of a whole home renovation the customer wanted a convertible guest bedroom. What we designed was a full size Murphy bed that fit into the closet. In order for the look of the room to be consistent with the other bedrooms we divided the closet space into two distinct areas, a double door and single door. Also since the bed was being manufactured by a different company than 27estore who manufactures the Teak doors in Europe we needed to come up with a solution. Once the design was created the plans went off to Lancaster Handcraft who was manufacturing the bed. On site we built the rough framing for the two closet areas and applied the drywall and finished the walls. Since the floorspace would not allow for bedside tables we built in a shelf behind and above the headboard. Installed an outlet on both sides for a lamp and charger plugs. The closed face of the bed was made to match the design of the closet doors and we used red oak panels with a custom matched stain color to complete the look. What the unit looked like when it was completed even impressed the customer. There are homes that only need a fresh coat of paint and a wood floor refinishing to make them like new again. And then there are other homes like this one that just need more, a lot more. Just to give you some perspective of the extent of the project; all of the interior doors were removed and the bedroom closets were divided into two distinct areas, a double door and single door; the synthetic carpet was removed and replaced with wool on the second floor; the old hydronic baseboard were removed and replaced with a new Runtal system and radiant floor system; new Pergo floors in the laundry and pantry to replace the existing linoleum; new paint in every surface; new pantry and laundry counters and shelves; new closet storage systems; new exterior doors, new stainless steel standing seam roofing to replace the rolled asphalt roof; new contemporary cement revealed panel siding to replace the vinyl. And that is just phase 1. When it comes to your customers’ safety you can never do enough, especially if you are working with those with a disability. This pathway has an energy efficient radiant mat from WarmZone, which costs only $0.28 per 100 square feet per hour to keep the path snow and ice free. Now I know that you don't consider using electricity as energy efficient but consider that the typical snow blower uses one gallon of gas per hour. The system has an efficient snow sensor system that will only activate the radiant pad when needed, saving energy and operation costs. The sensor activates the radiant heating system when moisture is present and the temperature reaches temperature to enable freezing to occur. This path is made of expose aggregate concrete and will be maintenance free for it lifespan. The pathway can be recycled later and ground into roadway substrate. ECO Building Solutions is "improving the planet one home at a time" . In order to make the lower patio unique the metal structure was left exposed to give it a utilitarian look. The congregated galvanized sheets were left in their silver tone but the metal I-beams were painted to match the vinyl shake siding. To offset the veneer stonework we used TimberSIL as contemporary wood wall paneling. The formed cement retaining wall was covered with sleepers to stand the wood panels off the wall surface. They were then stained flat black to hide them from view. The panels were cut to size, stained, and installed. Four low-voltage wash lights were installed to highlight the walls and to create a more intimate mood. When working in a watershed area common building practices go out the window and a whole new level of care comes into play. Being only 20' from a running protected creek we needed to scrutinize every piece of material we use that could perk toxins into the water. After some serious research we came to a wood product by TimberSIL to provide all of the word for the deck. TimberSIL is a non-toxic fusion of wood and glass, producing an ideal natural product that is many times stronger than composite products. TimberSIL wood is fire retardants, will not rot or decay, and carries a 40-year warranty. The finish is from Seal-Once that has zero VOCs (Volatile Organic Compounds), is non-toxic, and when Seal-Once dries on a substrate, it does not leach out or become hydrolytically unstable. From an aesthetic standpoint we have tucked the stairway into a nook in the house, are using old hand-huen beams as deck posts, and have wrapped the support pilings in veneer stone. 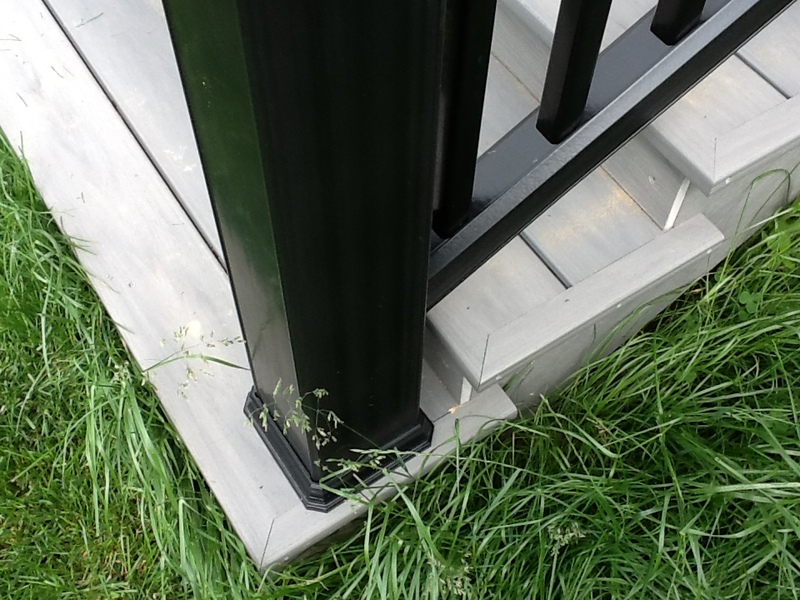 To minimize any visual obstruction of the creek we are using an anodized thin metal railing. Put Some Shrimp on the Barbie for me. 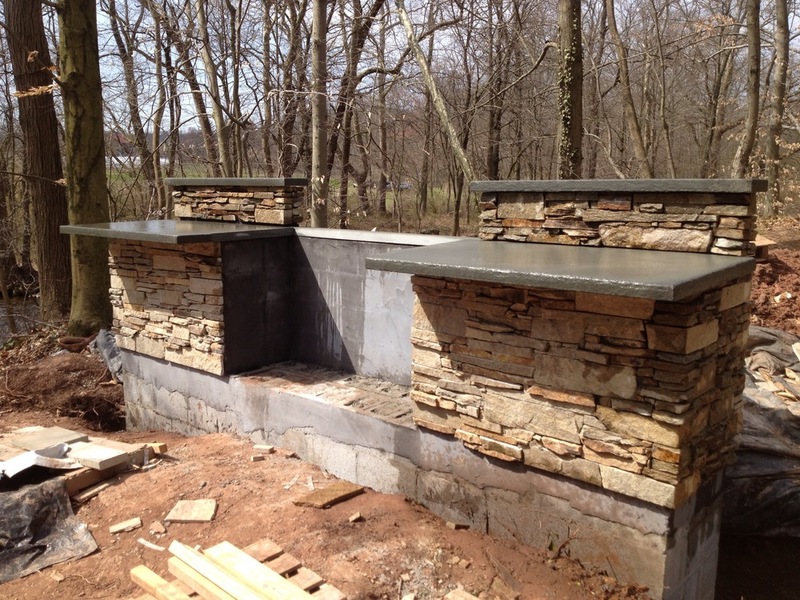 While the electricians rough-in the electrical service on the garden building we decide to move ahead with some of the landscaping projects beginning with the outdoor kitchen unit. We excavated the area for footings the keep the unit stationary when we regrade the area behind the grill and use it as a retaining wall. 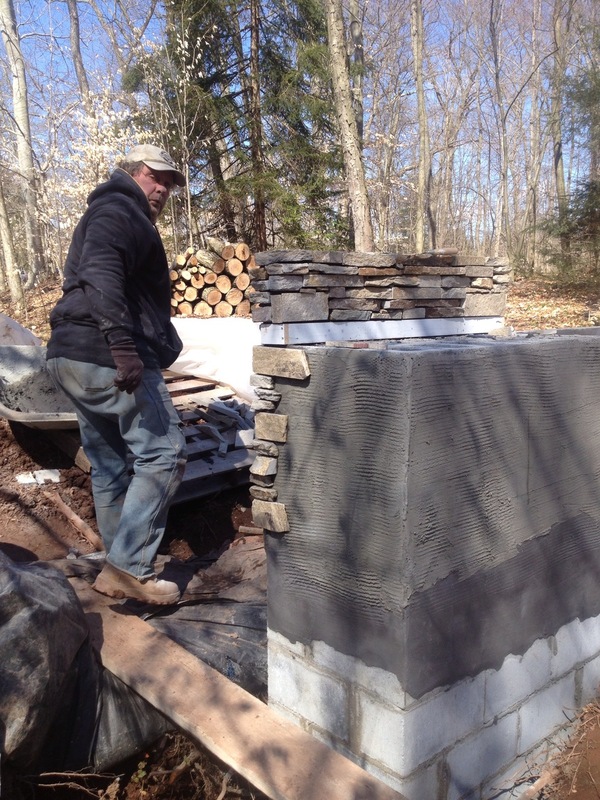 Bock was laid as an underlayment and then the Hudson Ledge Stone veneer was added . The countertop and back splash are being cut to size locally at Stoney Run Building Materials. We are also installing two LED wash-lights under each of the backsplash caps. The actual grill is being custom made by Gaucho-Grills and is an Argentinean style charcoal grill. I always enjoy the challenge when a customer comes to me with and idea and materials they want to recycle into a new structure, as was the case with this client. After spending time talking with the client to better understand that they envisioned, one unique structure to house their motorcycle collection and they're gardening tools, we then walked the property to find the best location to locate this structure. The basis for the design/build was a 350 square foot structure that needed to house four motorcycles and have a separate space for gardening tools and a potting table. Also we also needed to integrate vinyl casement windows, saved from the demolition of the original house, into the new building. The customer wanted the project to be as green as possible. After getting an approved design concept we needed to match the main house materials including the, CertainTeed Monogram 4” vinyl clapboard siding and 7” Cedar Impressions vinyl shake siding, Tamko Heritage asphalt shingles, and Natural Stone Veneer Hudson Ledgestone veneer stonework. 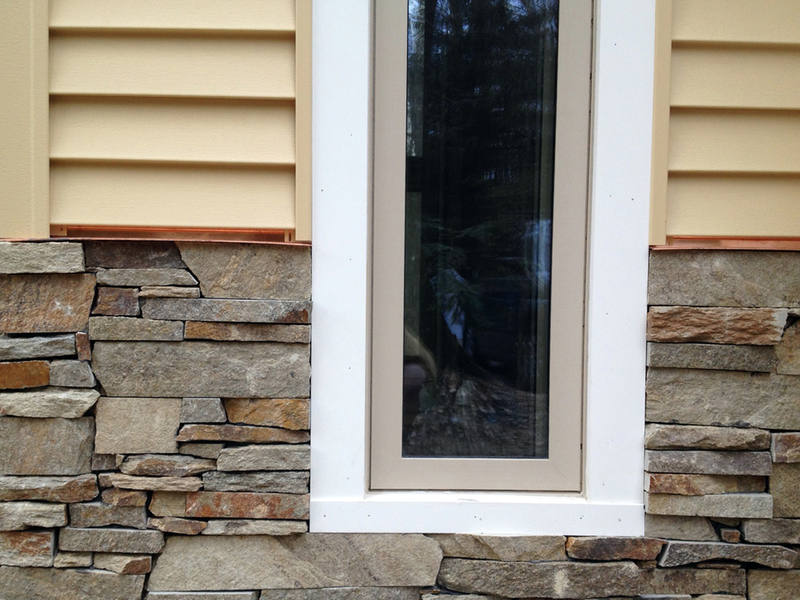 Also used were copper flashing above the stonework, and Bodyguard eco-friendly trim. All of the building materials used are formaldehyde-free. This place between the pines provided a joy-to-the-eyes for the customers. The owner of HenHouse Studio needed a permanent home to use for work, classes and gallery space. When I arrived to walk through the space they took me into the garage, and explained that they wanted to convert the first garage bay into a usable space. 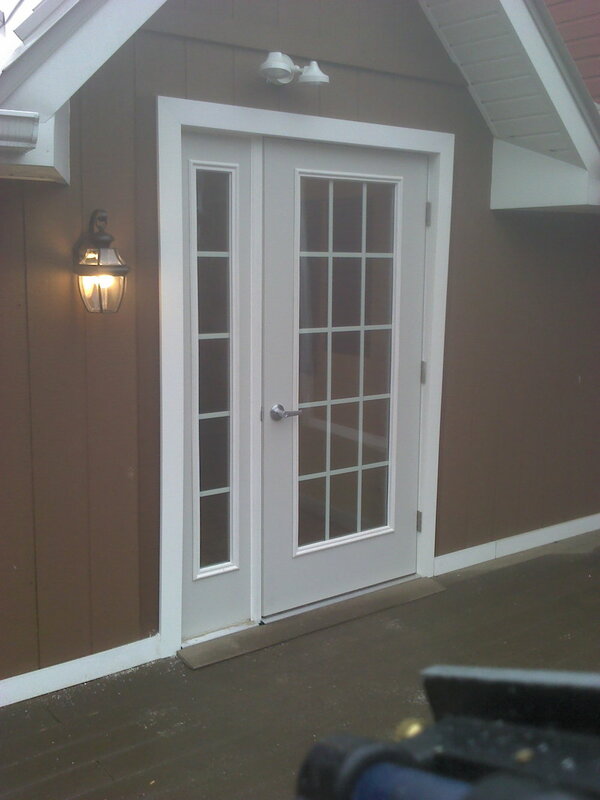 We could lighten up the space by adding windows but we needed to incorporate the existing garage door into the design. What we designed was a space that incorporated a utilitarian theme. 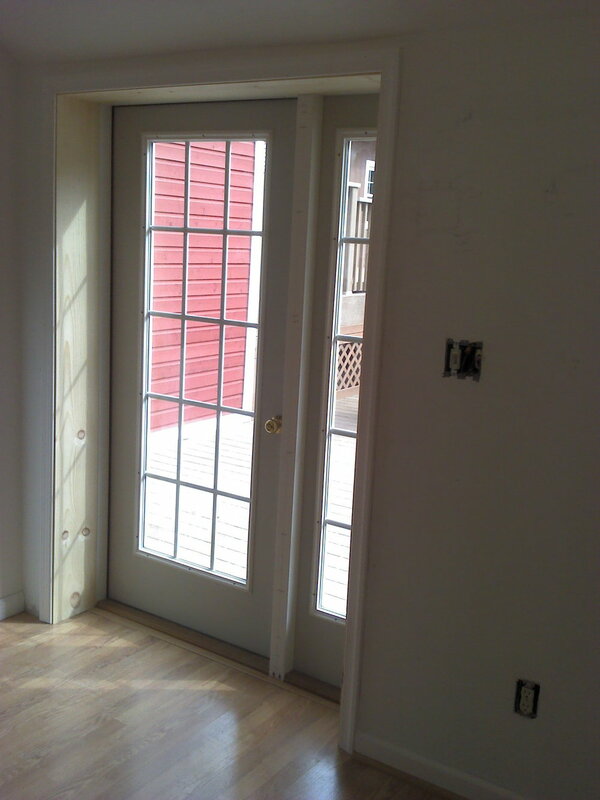 The original door was removed and reused as the interior door, two new floor to ceiling windows were added and a new outswing French door was added. The ceiling is unfinished pine beadboard and the existing old beams were left exposed. The way that the garage door windows were framed and trimmed made it difficult to recognize them. To keep the utilitarian theme the hanging lights are warehouse lights, and even the picture rail molding are made from galvanized pipe. When I arrived at the job site, took the tour and listened to the customers hopes for the space I had to wonder if it was possible within his budget. So off to the drawing board to create plans and a budget. Much to my surprise with some creative detail work it was possible. The original entry had a dirty carpet floor, dingy walls painter in three different tones of white, and an open closet. With some tile and closet doors from Lowes and some white paint we were able to make the space very usable. The next room to get a facelift was the kitchen. Well, when we arrived it was a plastic utility sink on linoleum flooring. We began by removed the old flooring, sanded and refinished the oak flooring with soy based finish. 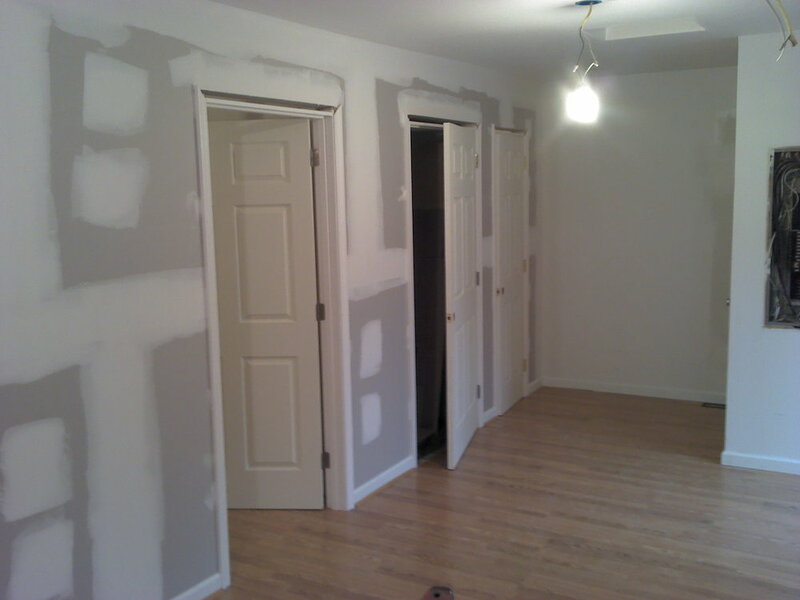 Then the walls, ceiling and trim were repaired and covered with nontoxic zero-VOC white paint. Finally we installed the wood cabinets and granite top, including a 20" range. The bath got some attention too. The sink, toilet and tub were all stained and pitted. The shower fixture was not functioning and needed some attention. And the room had an overall dirty look. 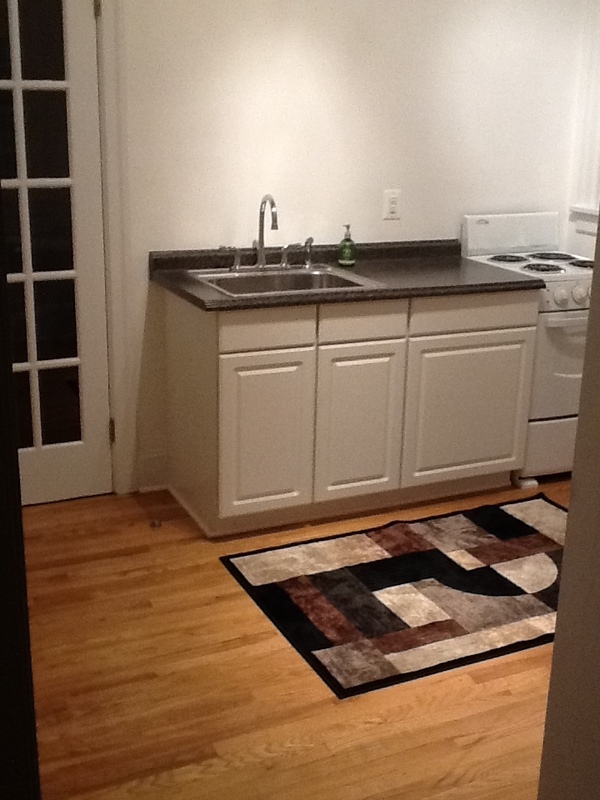 We began again by removed the old linoleum floor and installed inexpensive tile. 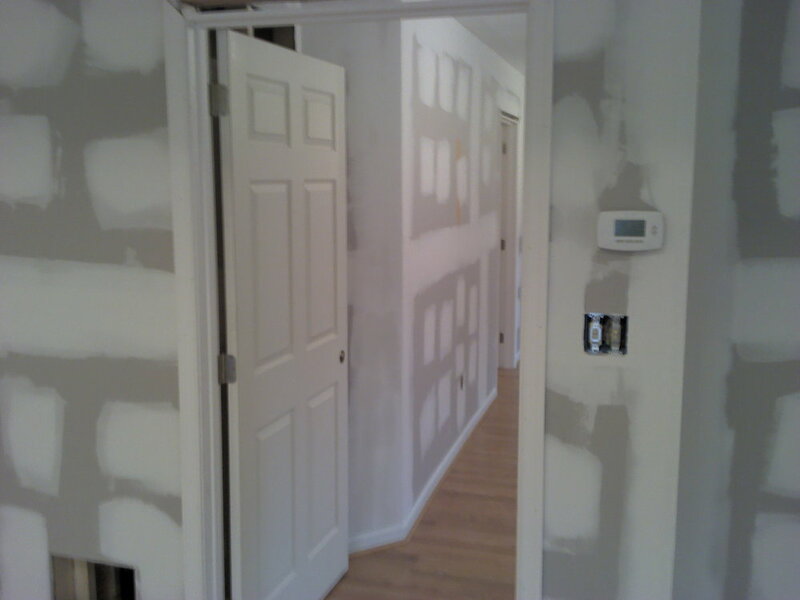 Then the walls, ceiling and trim were repaired and covered with nontoxic zero-VOC white paint. The original sink and toilet were replaced, but the cast iron tub was refinished onsite. Since we didn't replace the tub the existing wall tiles were saved and regrouted. The tub and sink fixtures were replaced. We installed a new dome light with a fan where there was none before and a switched vanity light. All the other rooms were repainted and detailed accordingly including the storage room which was converted into a conference room. The walls and ceiling were covered in pine beadboard and painted white. The customer wanted a new clean look for her kitchen. Many options were discussed including new cabinets, but in the end we decided to save the old cabinets and freshen them up with some paint, new hardware and some wainscoting. The old cabinet doors were taken off site, sanded and coated in multiple coats of white paint. The base cabinets were painted on site. The center island cabinets were covered in pine wainscot and then painted. The finished look revitalized the kitchen and gave the customer what she hoped for without adding any material to the landfills. One of my customers wanted a trash shed for their current home, but they wanted one that could move with them in the future. What we came up with is a unit that can disassemble into basic wall units that can be reassembled using one tool. There was no good space for the unit to sit on so we poured a cement pad to give it a good foundation. There are three bays that open to garbage and recycle bins. There is no top because the waste containers have their own tops. On the back side is an area for fire wood under a small cedar shed-style roof. The whole unit is made of cedar. As I drive from job to job is never ceases to amaze me how uninspiring and even downright unappealing the decks are in new development neighborhoods. While doing a finish carpentry job in the formal living and dining rooms the homeowner asked me to come outside to get my opinion on his deck. The previous owner of the property invested a great deal of money on a well designed deck but because it was completely close in under the deck the decking had deteriorated. We removed the decking and surround and power-washed the framing, then allowed it to dry completely before installing the new decking. We were careful when removing the decking and were able to save the white vinyl hand railing. Before installing the new decking we checked and corrected all of the framing for level, plumed all of the posts, and replace all of the rotten stair stringer. We then installed all of the blocking for the new decking perimeter boards and partitions. The decking went on smoothly with a new pneumatic hidden fastener nailer which drives 3" screws into the framing. The stair risers and rim board are in white paint grade vinyl (PGV) to compliment the dark wood tone decking. The overall look of the deck exceeded the homeowners hopes and the price was below budget. 95% of each composite decking board contents recycled and reclaimed plastic and wood fibers. 70% of all the plastic bags recycled in the U.S. are part of an in-store collection program used by TREX. Another customer another dream deck realized. 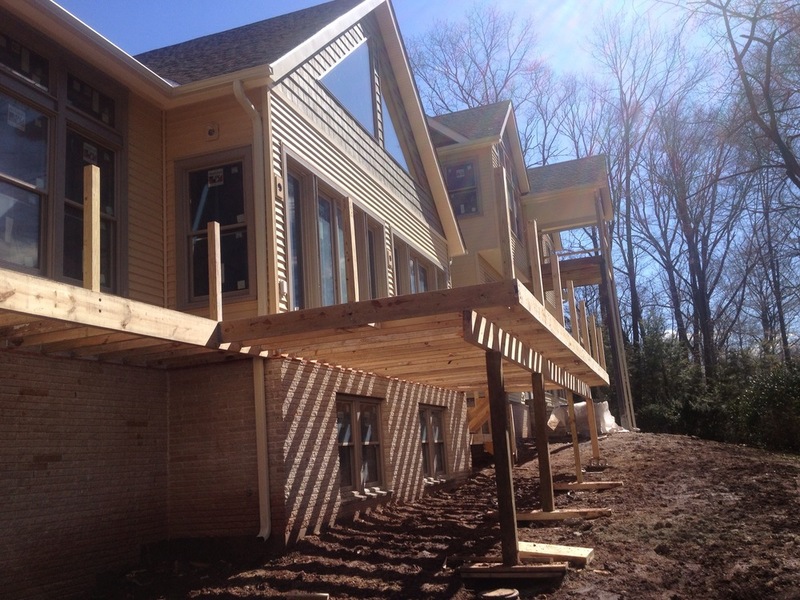 Most development homes come complete with a treated wood deck. The homeowners live with them even though the want more. Then the time comes when they can wait no longer for their dream deck to be realized This deck has two sets of 3' wide stairs one off the side and another off the back. Both ended at ground level into a rain swale. The homeowners wanted a decked walkway that bridged the swale and terminated on the hillside. They also wanted one comfortable entertaining area. The decking material was removed and recycled into a walking path on the property. We first tested to determine that all the arsenic was gone and then the decking was cut into sections, then laid for a dry walking path through the tree line. Then the framing was checked for level, new framing and stairs were added, some railing posts were repaired, and blocking was added for the decking details. The new decking was installed on diagonals and were partitioned into 12' sections. Next the "bridge" was installed and the main stairway was added. Then the entertainment seating and railing were added. Finally the pergola and lighting was installed. 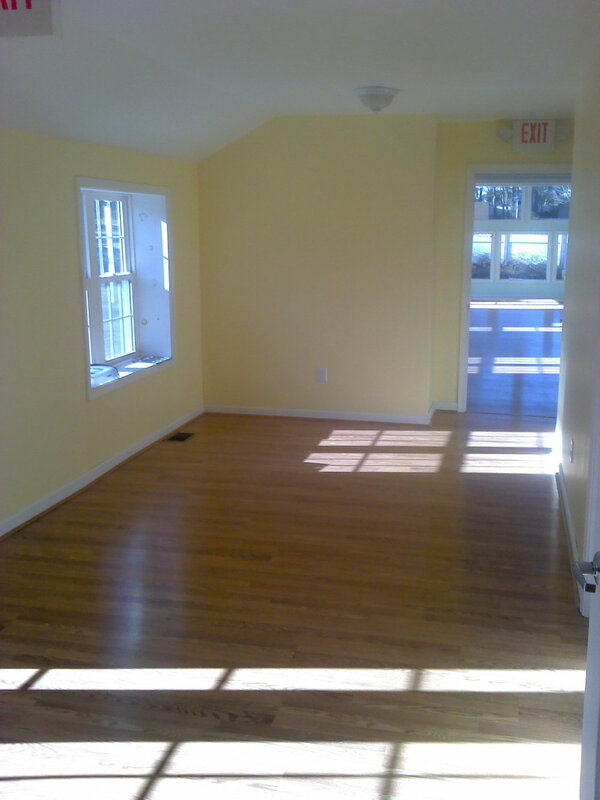 When Sacred Centers East Yoga, Spirituality & Wellness move into their new home in Chester Springs, PA they asked for our help to create a space conduce to yoga and meditation. We met with the owner to understand how they intended to use the space. What evolved was a design that divided the spaces into separate areas to accommodate what they needed a large yoga room that had space for mat and prop storage, a second room for meditation, an ADA compliant bathroom, a lobby, and a storage space. Noise management was also an important consideration so storage spaces, thick walls, and insulation was built into the final design and construction. The interior spaces we constructed produced a location that married to their brand personality, was quiet to be in, and allowed for comfortable use of the spaces. Another unappealing development home deck, another dream deck realized. I met with the home owner over the weekend to discuss their dream for what their new deck could be. The existing deck was a basic 15' square deck with a set of 3' stairs off each side. They also wanted a stairway off their laundry room. There was a doorway but no stairs. After batting around some design ideas and materials we arrived at a design. The new deck consisted of a large entertaining area but no railing and a large graceful stairway across the whole front of the deck with two benches acting as railing on each side. The stairs have a standard 7" rise and have a wide 15" run to either sit on or hold large potted plants. The 15" wide benched are held above the deck by 6"x6" cedar posts. The deck leading off the laundry room consists of a small platform and three steps fanning out in three directions. There is a pergola above with wisteria vines climbing on vertical wires located on two sides of the deck. © 2018 ECO Building Solutions, all rights reserved.